Monson: Dave Rose is gone. Good luck to BYU finding a willing, difference-making replacement. Leah Hogsten | The Salt Lake Tribune ÒWe had a lot of wins, and I hope everybody had fun, said Rose, who finished second on the schoolÕs all-time winning list. Dave Rose announced on Tuesday that he was retiring after a 14-year career in which he became BYUÕs all-time winningest menÕs basketball coach. Leah Hogsten | The Salt Lake Tribune ÒWe had a lot of wins, and I hope everybody had fun, said Rose, who finished second on the schoolÕs all-time winning list. Dave Rose announced on Tuesday that he was retiring after a 14-year career in which he became BYUÕs all-time winningest menÕs basketball coach. 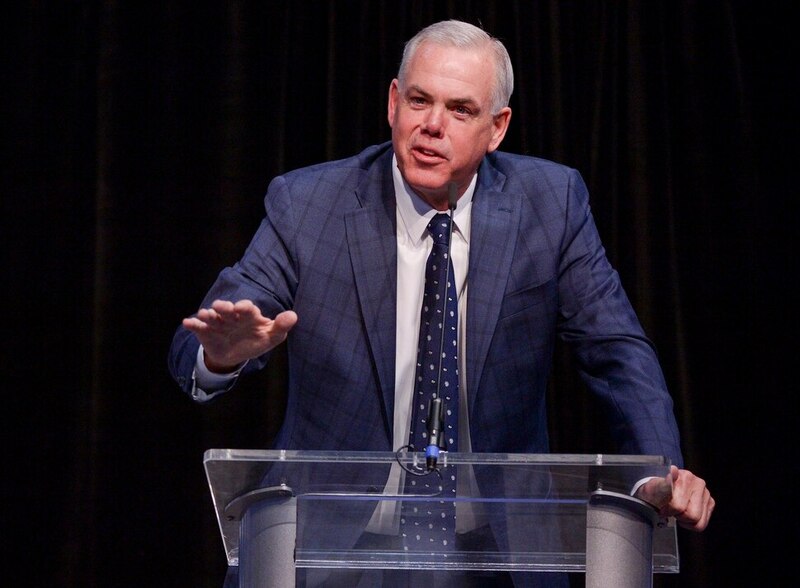 Leah Hogsten | The Salt Lake Tribune I'm 61-years-old and I still havent worked a day in my life, said Dave Rose, who announced on Tuesday that he was retiring after a 14-year career in which he became BYU’s all-time winningest men's basketball coach. Leah Hogsten | The Salt Lake Tribune I'm 61-years-old and I still havent worked a day in my life, said Dave Rose, who announced on Tuesday that he was retiring after a 14-year career in which he became BYU's all-time winningest men's basketball coach. Leah Hogsten | The Salt Lake Tribune I’m 61-years-old and I still havent worked a day in my life, said Dave Rose, who announced on Tuesday that he was retiring after a 14-year career in which he became BYU’s all-time winningest men’s basketball coach. Leah Hogsten | The Salt Lake Tribune Dave is leaving this job with no regrets because he has given it everything he has. HeÕs left it all out there and thatÕs all heÕs ever asked his players to do, said Cheryl Rose of her husband. Dave Rose announced on Tuesday that he was retiring after a 14-year career in which he became BYU's all-time winningest menâs basketball coach. 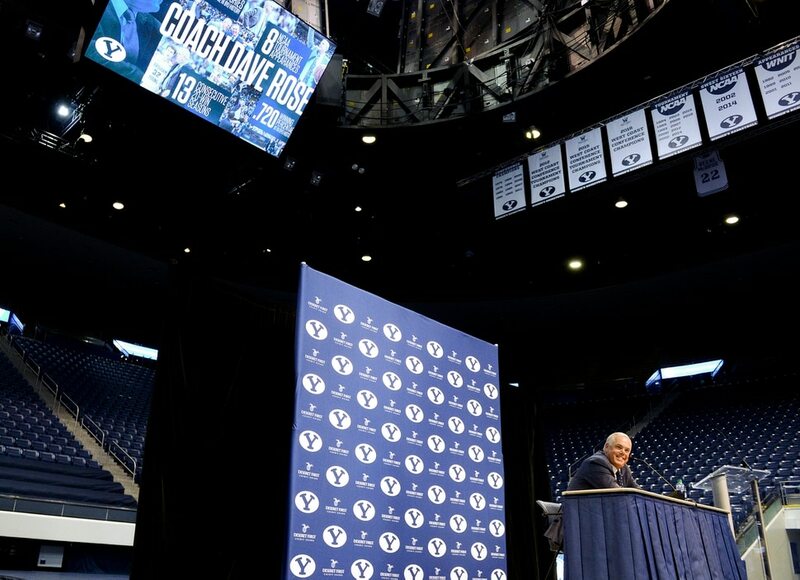 Leah Hogsten | The Salt Lake Tribune IÕve always felt like these were numbers, just numbers on a page and people tell me at times they are impressive numbers, said BYU coach Dave Rose, pointing to his record shown on a big screen. What IÕll always remember are the players, the relationships IÕve had with the guys. Dave Rose announced on Tuesday that he was retiring after a 14-year career in which he became BYUâs all-time winningest menâs basketball coach. Leah Hogsten | The Salt Lake Tribune BYU coach Dave Rose and BYU athletic director Tom Holmoe embrace before Rose spoke to the media. Dave Rose announced on Tuesday that he was retiring after a 14-year career in which he became BYU's all-time winningest men's basketball coach. Leah Hogsten | The Salt Lake Tribune Dave Rose announced on Tuesday that he was retiring after a 14-year career in which he became BYU’s all-time winningest men’s basketball coach. Leah Hogsten | The Salt Lake Tribune Dave Rose announced on Tuesday that he was retiring after a 14-year career in which he became BYUÕs all-time winningest menÕs basketball coach. Leah Hogsten | The Salt Lake Tribune Cheryl Rose hugs friends prior to her husband announcing his retirement. Dave Rose announced on Tuesday that he was retiring after a 14-year career in which he became BYU's all-time winningest men's basketball coach. Leah Hogsten | The Salt Lake Tribune BYU athletic director Tom Holmoe listens as BYU basketball coach Dave Rose talks about his career. Rose announced on Tuesday that he was retiring after a 14-year career in which he became BYUÕs all-time winningest menÕs basketball coach. Leah Hogsten | The Salt Lake Tribune Cheryl Rose and Taylor Rose laugh at Dave Rose's quip that now Taylor was a law student, he could look forward to free legal representation. ÒWe had a lot of wins, and I hope everybody had fun, said Rose, who finished second on the schoolÕs all-time winning list. Dave Rose announced on Tuesday that he was retiring after a 14-year career in which he became BYUÕs all-time winningest menÕs basketball coach. Leah Hogsten | The Salt Lake Tribune ÒWe had a lot of wins, and I hope everybody had fun, said Rose, who finished second on the schoolÕs all-time winning list. Dave Rose announced on Tuesday that he was retiring after a 14-year career in which he became BYUÕs all-time winningest menÕs basketball coach. Leah Hogsten | The Salt Lake Tribune ÒWe had a lot of wins, and I hope everybody had fun, said Rose, who finished second on the schoolÕs all-time winning list. Dave Rose announced on Tuesday that he was retiring after a 14-year career in which he became BYUÕs all-time winningest menÕs basketball coach. Leah Hogsten | The Salt Lake Tribune Garrett Rose and his family listen as his father gives remarks on his retirement. 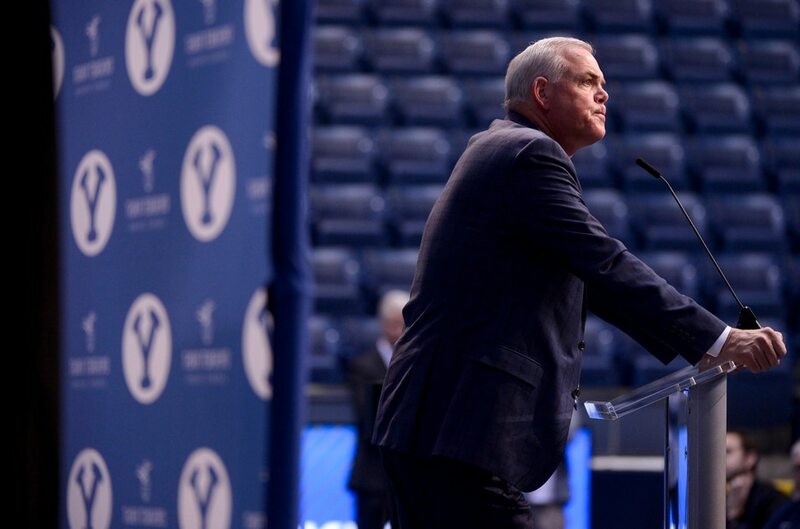 BYU head basketball coach Dave Rose announced on Tuesday that he was retiring after a 14-year career in which he became BYUÕs all-time winningest menÕs basketball coach. Leah Hogsten | The Salt Lake Tribune ÒWe had a lot of wins, and I hope everybody had fun, said Rose, who finished second on the schoolÕs all-time winning list. Dave Rose announced on Tuesday that he was retiring after a 14-year career in which he became BYUÕs all-time winningest menÕs basketball coach. Rose hugs players above in the Marriott Center. The pain is in the but. The BYU basketball coach, who’s been sent packing — after a series of recent meetings centering on a proper buyout — by administrators, had his ups and had his downs over his 14 seasons, but spent most of his tenure in Provo somewhere in between. The Jimmer years were terrific, spent near the top of the college game, and the rest of Rose’s time wandered around in a kind of 20-win, 10-loss no-man’s land. The Cougars were always good, never great. Rose never won a conference tournament, even in the West Coast Conference, a mostly unimpressive church league from which the word ‘mostly’ could be extracted were it not for Gonzaga and Saint Mary’s. The Cougars could never fully wrestle the WCC away from the Zags. And sometimes, they got pinned by league members you wouldn’t expect them to lose to — outfits such as San Diego, Portland, Pacific, Pepperdine, Santa Clara and Loyola Marymount. Rose’s tenure had its moments, generated, as mentioned, by Fredette, the shooting sensation that captivated college basketball over his final two seasons, the last of which he was named national player of the year. Those were heady times. But they didn’t endure, fading away into more of the same mundane goodness. The coach’s records through the years look consistent and clean — a drum-banging slate of wins and losses. His winning percentage was the best in school history. All told, Rose’s teams won 348 games and lost 135. That win total might change, depending on an appeal by the school to halt a vacation of victories by the NCAA on account of the Nick Emery case, a fiasco that embarrassed BYU. Either way, there was atrophy in recent times. BYU hasn’t been to the NCAA Tournament in four years. Its teams, while sometimes fun to watch at a typical fast pace, often didn’t play much defense and lacked offensive discipline, enabling players to jack up whatever shot suited the overly-eager. It’s as though the program was vexed by Fredette’s past success, too many players wanting to be him. Monson: How good is Gonzaga? Maybe good enough for a championship. Monson: Looking for a team to root for as Salt Lake City hosts the first two rounds of the NCAA Tournament? Meet the New Mexico State Aggies. In recent years, Rose couldn’t keep players in the program, losing underclassmen not to the NBA, but to substandard foreign pro leagues or other schools where they often saw only modest success. Which is to say, those players wanted to get out of Dodge and stay gone. As for highly recruited great players, the Cougars simply could not reel them in. Frank Jackson, for example, was a promising talent out of Utah County and a BYU recruit — until he blossomed as a prep player and signed with Duke, instead. If a school can’t recruit premier players and can’t keep mediocre ones, it won’t ever be capable of elevating past what BYU’s done. If that’s the coach’s fault, blame Rose. If it’s the school’s fault for having difficult rules to follow, a tough admissions standard, a status for basketball that is secondary to football and football’s independence, having been stashed in a league full of 3,000-seat gyms, then blame BYU itself. This past season, it was easy to see a downward spiral. The Cougars were beaten badly in their first game of the WCC tournament. Their last seven losses came by an average of 22 points. BYU finished 19-13, not horrible, never horrible, just … stuck on a boring treadmill Rose couldn’t get off of. Spectatorship started to dry up and enthusiasm for the program, on the whole, was greatly diminished. The future looks muddled, at best. Who will BYU find to lead the program? More than a handful of qualified temple-recommend-carrying coaches whisper that they’re not interested. Don’t know if what they whisper now is different than what they would say if they were fully offered a multi-million-dollar contract, but the problems and the hesitations exist for fairly good reasons. Could Utah Valley’s Mark Pope overlook and overcome them? Portland State’s Barret Peery? Would the Jazz’s Alex Jensen give up a top assistant’s job with an NBA team to haul these boulders around? Rose, a fine person, a strong man who beat cancer and helped others do likewise with his off-the-court work, was and is a good coach. Great was never in the cards. And only a great one could improve the circumstances at BYU enough to make any kind of difference. If Cougar basketball was a stock, would you buy it? Buy low, they say. But it doesn’t profit anyone to buy low if the stock stays low, and by low, we mean an also-ran in the WCC. The only way BYU basketball gets better is if a dynamic, innovative, charismatic mentor who absolutely understands the nuances at the school was hired to lead it, a coach who not only knows his X’s and O’s, but who could draw in and keep the best LDS talent, firing straight through the inherent limitations that BYU creates for itself, enough to win, to win big.